I’m sure there’s a contingent about a million strong that own or simply love pug dogs. 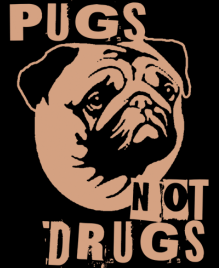 And I am equally certain that I would be doing those people a disservice if I didn’t do everything in my power to bring this Pugs Not Drugs t shirt to their attention. Don’t you agree? I mean you have to really have a heart for a dog as ugly as a smash faced pug. It has to be baked into the DNA, and once something grabs a hold of you at the cellular level there’s nothing you can really do but give in to your desires, such as buying every piece pug merchandise ever created on Earth. Hey all you pug fans, don’t thank me, thank Donkey Ts. They put the thing together and offered it for sale. I’m just the messenger. Don’t kill me when I deliver bad news, but don’t give me too much credit when I deliver the good stuff either. Keep it even keel.